When she first began studying the people who had terrorized her country, Natalia Trujillo prepared herself to come face to face with monsters. She would be interviewing former combatants from the long, bloody conflict that had gripped Colombia for more than 50 years. The complex power struggle between guerrilla insurgents, the government, paramilitary groups and drug traffickers had killed hundreds of thousands of people and displaced millions. 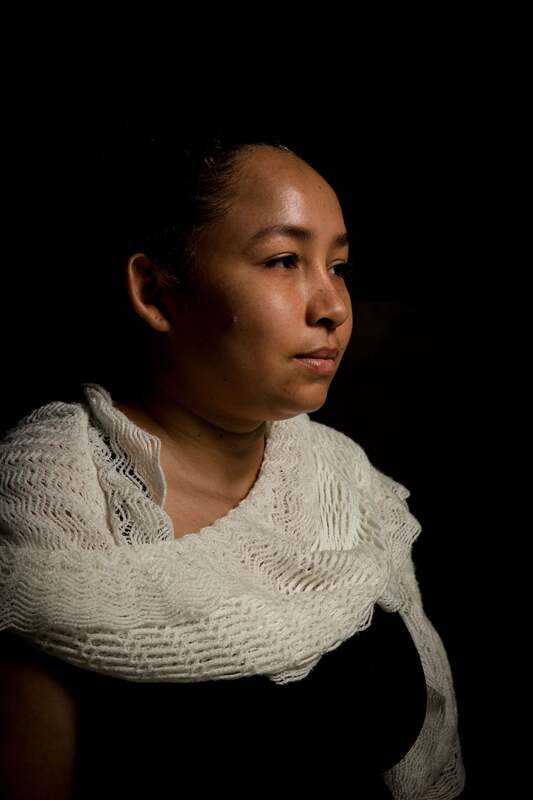 Four of Trujillo’s family members had been kidnapped, and the violence had driven her father from his farmland. Some of her colleagues had experienced much worse. Trujillo, now a neuroscientist at the University of Antioquia in Medellín, was interested in studying the psychological roots of violence by looking at fighters who had laid down their weapons and were trying to re-enter civilian society. Her chance came in 2010, with a government reintegration programme that had gathered hundreds of ex-combatants for the day in Medellín’s botanical garden. She and her research team entered the enclave with a battery of cognitive tests, panic buttons—in case something went wrong—and some preconceived ideas. “I thought people who can kill their neighbours, that can destroy their communities, that can have the heart to force other people to abandon their farms—they have to be really bad,” Trujillo says. She found a few who met her expectations. With chains around their necks and boastful swaggers, some tried to intimidate the researchers. But more often, the scientists found ordinary people, strolling in the garden and eating ice cream with their children. That recognition has led Trujillo and her colleagues to re-examine not only their own feelings about ex-combatants, but also the country’s approach to dealing with them. Colombia’s government is currently engaged in one of the largest peace efforts in history. As part of a 2016 treaty with the left-wing guerrilla group known as the Revolutionary Armed Forces of Colombia (FARC), the government will grant amnesty to fighters who leave the conflict and complete a re- incorporation programme, provided they have not committed serious crimes. Around 6,800 FARC fighters have entered already. The effort, which is politically controversial and expected to cost 129.5 billion Colombian pesos (US$46 million), faces overwhelming odds. But it grants scientists a unique opportunity to understand a population that has both inflicted and suffered the horrors of war. Most research into the psychological roots of violence and trauma has been performed with veterans from wealthy countries who fought in conflicts far from home. Most of Colombia’s ex-combatants, by contrast, have little education and are trying to re-enter the same society they once terrorized. There, they face enormous stigma and resentment, which makes it difficult for them to find work and form relationships with others. A handful of scientists are now studying the former fighters in unprecedented detail, in the hope that they will be able to inform and guide the peacemaking process. They have found that years of isolation and exposure to violence might have altered the ex-combatants’ psychology and cognitive processing in subtle ways. In laboratory tests, many have difficulty empathizing with others and make flawed ethical judgements—shortcomings that could affect how they engage in civilian life. Scientists are now setting up long-term studies in towns that were plagued by conflict, to track how cognition and attitudes might change over the course of the reconciliation process, both for ex-combatants and for civilians. The data could eventually inform other war-torn countries’ recovery efforts. But the research is also revealing just how deep the challenge is. And some experts worry that the care available to ex-combatants in the meantime is inadequate. “It’s going to be incredibly difficult to get out of this vicious cycle,” says Jiovani Arias, a psychotherapist and political scientist at the University of the Andes in Bogotá. Without investment in improving mental health, he says, the legacy of violence that affects ex-combatants and civilians alike could torpedo Colombia’s precarious peace efforts. Colombia’s armed conflict waxed and waned for half a century as various militant groups vied for control of territory. Civilians were caught in the crossfire: more than 260,000 people were killed and 7 million displaced during the decades of violence, according to a government registry of victims. The Meta region, where Vista Hermosa lies, was one of many areas abandoned by the Colombian military in the 1990s and left to be governed alternately by paramilitary groups and guerrillas. It was a fraught arrangement. The guerrillas helped to develop infrastructure but were swift to kill suspected informants. The paramilitaries, hired mostly by drug lords and wealthy political elites, tended to be more ruthless, torturing suspected spies and leaving bodies across the doorsteps of elementary schools. Both sides dealt heavily in the cocaine trade and kidnapped thousands of people for ransom—including Matallana’s brother. Since the 2016 peace deal, FARC combatants have been allowed to enter a disarmament and rehabilitation campaign run by Colombia’s Reincorporation and Normalization Agency (ARN) in Bogotá. The ARN had been established years earlier, and it has since facilitated the reintegration of some 20,000 paramilitaries and guerrillas who left the conflict independently or as part of a separate peace agreement. For newly re-entering FARC members, the ARN now operates 26 makeshift settlements throughout Colombia, known as transit zones (see ‘A lingering conflict’). They offer amenities such as education and health care, and help to provide at least a measure of protection for the ex-combatants, who are regularly targeted by former enemies, former allies who refuse to surrender, and civilians. After completing a programme, ex-combatants can receive ID cards that allow them to live and work legally in the country. The prospect of their return doesn’t thrill some local residents of Vista Hermosa. A road sign in Spanish that reads “Together, peace and life after the conflict are possible” has been pelted with pink paintballs. “Someone disagrees,” remarks one of the researchers. Matallana and Carlos Gómez, a psychiatrist at Xavierian, are planning to launch a 10- to 20-year study following more than 2,000 people in Vista Hermosa, civilians and ex-combatants alike. “We are planning for the first time—in Colombia and the world—to learn what things help for reconciliation,” Gómez says. The team intends to measure factors such as neurodevelopment in children, social cognition and emotional regulation in adults, and all participants’ mental health to aid the reintegration process. In a pilot project funded by philanthropic foundations, they have surveyed 200 civilians, plus representatives for 150 ex-combatants living in a transit zone just 3 hours away. “We need to have good data to see how it works, and how we could make interventions rapidly if we see the process is not coming well,” Gómez says. It’s been hard for researchers here and elsewhere to study whether such programmes can prevent combatants from returning to crime, largely because it is often impossible to track the outcomes of people who go through them. “We just assume it has an effect, and we have no other choice,” says Enzo Nussio, a political scientist at the Swiss Federal Institute of Technology in Zurich. Yet Nussio and others are hopeful about Colombia’s prospects. It has many more resources to devote to the effort than countries, such as Burundi and Sudan, which have taken on similar efforts with little success. The former combatants, meanwhile, face a mix of challenges—some familiar and some new. Like veterans from other conflicts, many find it difficult to be around people who do not understand the experience of combat, says Thomas Elbert, a psychologist at the University of Konstanz in Germany. They may reach out to others who have lived in violence, which can be dangerous in a place such as Colombia, where drug traffickers and other armed groups still operate. Colombia itself poses some unique challenges, Gómez says. Unlike those fighting civil wars in many other places, Colombia’s guerrilla fighters are not driven by race or religion, but by political ideology. Reprogramming their hearts and minds might call for strategies different from those used for other radicalized militants, war criminals or serial killers, and no one knows what those strategies should be. West of Meta lies Valle del Cauca, a mostly flat agricultural region surrounded by mountains. Here, in a luxurious hotel overlooking vineyards and sugarcane fields, former FARC commander Juan Carlos Sánchez is watching videos on a laptop. Designed for research, they feature different types of altercation: an argument between two people, someone getting bumped by a chair, one person stabbing another in the back with a knife. Sánchez joined the guerrillas in 1998 while living in Meta. It was not entirely by choice, he says. When the Colombian military abandoned the region, the FARC became the defacto government. The guerrillas persuaded locals to arm themselves in case the paramilitaries and government returned, telling them that this was the only way to protect their families. Eventually, Sánchez joined the group officially. At first, he says, the guerrillas did not attack civilians—they just schooled their recruits in politics and warfare skills. But over time, the FARC became more violent and suspicious of others. “From the day I entered the organization to the day I deserted, I always had questions,” he says—about himself, his comrades and the people giving orders, particularly, their willingness to kill former allies. But Sánchez kept quiet because questioning orders would get him killed. Instead, he rose in the ranks, eventually leading some 25 fighters. By 2005, he had become more disillusioned with the FARC. A list of suspected informants he had been ordered to kill included 12- and 13-year-old children, as well as 2 people whom he knew from his childhood. He ordered his troops to do it—something that haunts him to this day. “It is you that carries the weight,” he says. Then, a few years later, the guerrillas convicted his girlfriend—also a FARC member—of espionage. Sánchez made plans to run away with her, but was discovered and had to flee on his own. He later learnt that she had been executed. For three years, Sánchez lived in hiding in Meta, seeing enemies everywhere. “I lived in constant worry,” he says. Eventually, a friend told him about the government rehabilitation programme, and he joined. He moved to Valle del Cauca and now clears fields for a living. He has seen a psychologist, and has begun reading the Bible. “Between the two, I’ve found a way to forgive myself and to forgive others,” he says. In the hotel, Sánchez watches the videos of altercations interspersed with a series of questions, probing whether the imagery bothers him, or whether a responsible party should be punished. Then he tries to identify the emotions on a series of faces. “We’re looking at what kind of mistakes they make,” says Agustín Ibáñez, a neuroscientist at Favaloro University in Buenos Aires, Argentina, who is administering the test, a mock run of the type he has given to around 350 Colombian ex-combatants. Ibáñez aims to discern how isolation from society and exposure to violence might have impaired their emotional processing and moral judgement. Ex-combatants—FARC and paramilitary alike—tend to have trouble distinguishing between emotions, especially fear and anger. 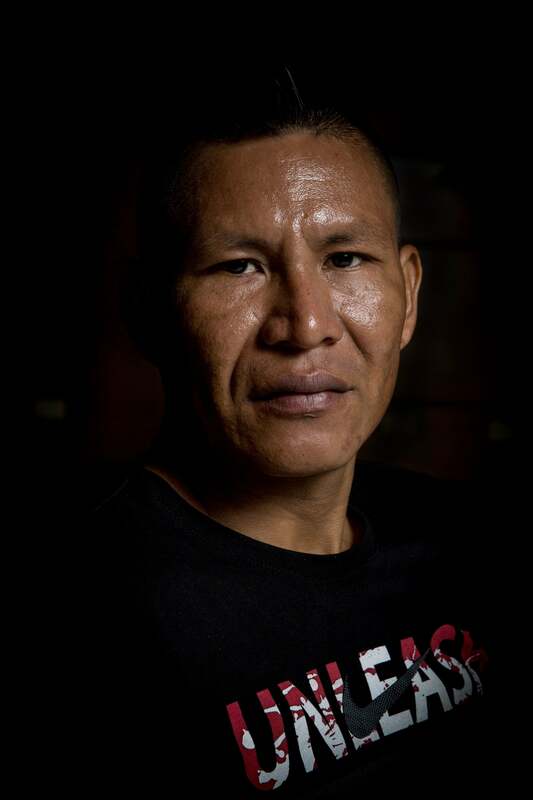 Although it is unclear whether these effects persist outside the lab, Ibáñez and his team worry that emotional problems could make life even harder for the former fighters, as they have for ex-combatants elsewhere. He and Eduar Herrera, a cognitive psychologist at Icesi University in Cali, began this line of research in 2014, working with a group of paramilitaries in jail for war crimes. They had killed an average of 33 people each, and some were responsible for massacring hundreds. In 2017, the researchers found that a key characteristic of ex-combatants is how they judge the morality of an action. Most participants would condemn an attempted poisoning, for instance, even if it failed to kill the target. But Ibáñez’s group has found that ex-combatants are less likely to condemn someone for a failed murder attempt, reasoning that if the victim didn’t die, there was no harm done. At the same time, they are more likely to want to punish people for harm that is clearly accidental. By their logic, the outcome is more important than the intention. On the basis of a small sample, it seems that paramilitaries are more impaired in this regard than guerrillas. Ibáñez says this difference could make sense: people who joined the paramilitaries for a salary may have been more attracted to violence than those who joined the guerrillas for ideological reasons, although there’s no way of testing this. The data suggest that rehabilitation programmes should not treat all ex-combatants the same. Trujillo has also found striking differences in her participants. In a study of 624 ex-guerrillas and ex-paramilitaries, she and her colleagues found that the ability to empathize fell into 3 clusters: 22% of ex-combatants functioned much like people who haven’t experienced violence; 32% had the ability to recognize pain or misfortune in others but weren’t as affected by it; and the rest could neither recognize feelings such as emotional distress in others, nor empathize with them. The researchers wonder whether these ex-combatants—who demobilized voluntarily—are similar to the 6,800 FARC fighters who entered the reincorporation programme as part of the 2016 treaty, many on orders from their commanders. Unlike Sánchez, many are still steadfastly ideological. Oscar Vega, for example, a slight, intense former FARC commander who lives in the transit zone near Vista Hermosa, steers almost every conversation around to ways in which Colombia’s government and educational system hurt people. He still lives for the cause. “Our documents and our ideology say that we have to take control of power either through arms or through a political way,” he says. Trujillo is comparing various types of therapy to determine how best to help the ex-combatants improve their performance in tests of empathy. And she and her colleagues are using electroencephalography (EEG) to monitor ex-combatants’ brain activity, hoping to learn how they process information. In unpublished research, the team has found that former fighters are quicker to recognize faces than are civilians—even though they are slower to identify the emotions on them. They are also better at performing memory tasks that are accompanied by violent imagery such as blood or corpses. People whom the researchers identified as victims of violence show the opposite pattern—such imagery disturbs their concentration and slows their responses. The researchers think that the ex-combatants’ neurocircuitry has adapted to react faster to threats. Trujillo’s group advises the Medellín branch of the ARN in its effort to rehabilitate ex-combatants. But trying to use science to inform policy can feel like sculpting with dry sand. “Research has been very complicated because it’s a very new topic, not just for Colombia but for cognitive and social neuroscience literature,” she says. Viviana Misas’s wrist bears the name of the baby she miscarried while living with the National Liberation Army (ELN)—another left-wing guerrilla group that is still active in Colombia. Misas joined the ELN at 15 years old to get away from her family, and grew to love the ideology and the companionship it provided. But then she fell down during a difficult march and was injured, losing her pregnancy. Her companions abandoned her, and she ended up in the hospital for a long time. Distrusting her loyalty after that, a fellow combatant—her closest friend—betrayed Misas to the Colombian army. She was captured and agreed to demobilize. Like Sánchez, she can’t return to her home in Medellín, for fear that the ELN would kill her as a traitor. Although Misas enjoys her work as a tour guide in Valle del Cauca, depression keeps her from pursuing her dreams. “I wish that when I get sad, I would be like a normal person that just gets sad for a little moment and doesn’t have thoughts as strange as mine,” she says. She hasn’t seen any psychotherapists, but her dog provides some solace, as does religion. Still, her thoughts turn dark—perhaps, she says, the real reason she joined the group was because she hoped to be killed. “How can I let go of those thoughts?” she asks. According to the ARN’s data, more than 90% of ex-combatants in the programme have a psychosocial problem, such as post-traumatic stress disorder or anxiety. Regional ARN coordinator Juan Fernando Vélez says that mental health is one of his top priorities in working with them. Trujillo’s data, he says, persuaded his office to create a special reintegration track for people with psychiatric problems. “We cannot give to society an individual that is not adjusted,” he says. Joshua Mitrotti, who directed the ARN for three years before resigning in March, says that the agency’s programmes are based on efforts in Central America in the 1990s, which provided vocational training and education for armed groups. Psychosocial support is an integral component, he says. The ARN’s programme for guerrillas and paramilitaries who demobilized voluntarily included 30 months’ worth of psychosocial services, from about 300 psychologists and 65 social workers, on average. So far, 20,490 people have completed the reintegration process, and the ARN says that more than 70% have successfully re-entered society. But with tens of thousands of ex-combatants in Colombia, there are simply not enough skilled mental-health practitioners to provide basic care, much less intensive cognitive therapy. As a result, some worry that the reintegration programme might be providing poor treatment. “It’s not that they are doing things wrong, but they are incomplete,” Herrera says. One challenge is the difficulty of providing treatment to adults who might not have completed elementary school and cannot read, a skill required for some common therapies. Mitrotti says that the ARN has been adjusting the approaches to make them more appropriate. According to the ARN, 30% of the people coming for psychosocial services last year did so without any monetary inducement (ex-combatants often receive a stipend for participating in programmes). “They are coming not because they’re paid but because they believe they need the support of our professionals,” Mitrotti says. But help for the newly demobilized FARC members has been slow in coming. Andres Restrepo, a sociologist who works in a transit zone in Caqueta, says that the FARC ex-combatants there are not receiving any mental-health care at all. Restrepo says the ARN has promised that 6 psychologists will come to the region, but that even that wouldn’t be sufficient for the 1,000 ex-combatants and their families living there, now. Restrepo fears that if these individuals are not psychologically stable, the rejection from society—including their own families—could drive them back into violence. “Nobody helped them imagine a life without weapons,” he says. 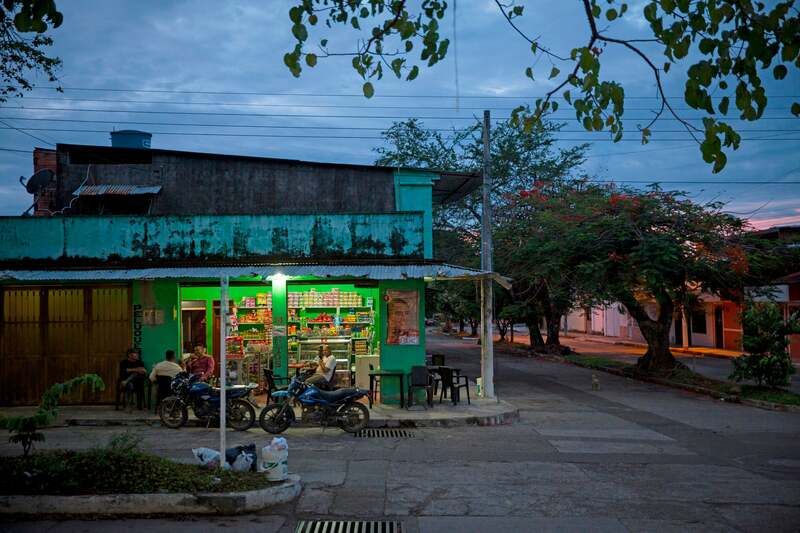 In Piñalito, a tiny, dusty town of fluorescent wooden houses on the outskirts of Vista Hermosa, civilians are still getting accustomed to peace. “It’s great—there are no dead people,” says Carlos Garcia, an elderly retired shopkeeper. He remembers hearing regular gunfire right outside his door as the FARC fought the paramilitaries. Now the streets are quiet and people linger at outside cafes. A few are missing legs; Colombia has one of the highest rates of landmine casualties in the world, and Meta is one of the most heavily mined regions. Against the backdrop of a government crackdown on the cocaine trade, falling oil prices and rising fears that peace is temporary, the people of Piñalito seem to have few prospects for the future. And the peace agreement itself is threatened. This month, Colombia will hold its presidential election, and the key issue is whether to renegotiate the deal to make it less favourable for the FARC. Many of the guerrillas, meanwhile, are losing faith in the process. Some of the transit zones where FARC members were required to live for a time still have no running water or sanitation. And farming and vocational-development programmes have been slow to take off. Across the country, more than half of the guerrillas have left the zones, opting to take their chances in a society that is unsafe for them. Since the agreement, hundreds of former FARC members have been killed. As ex-combatants re-enter society or retreat into the jungle, experts worry about the stigma they carry—of being affiliated with the FARC and of mental illness. Matallana hopes that one of the things her research can do is to show the public how trauma affects ex-combatants and civilians alike. Travel funding for this project was provided by the Pulitzer Center on Crisis Reporting. This article is reproduced with permission and was first published on May 3, 2018.